Camshaft alignment tool – No.T10252. Camshaft adjuster socket – No.40080. Chain tensioner retaining tool – No.T10092. Chain tensioner locking pin – No.T10115. Ensure timing mark on timing belt camshaft sprocket aligned with mark on timing belt rear cover  . 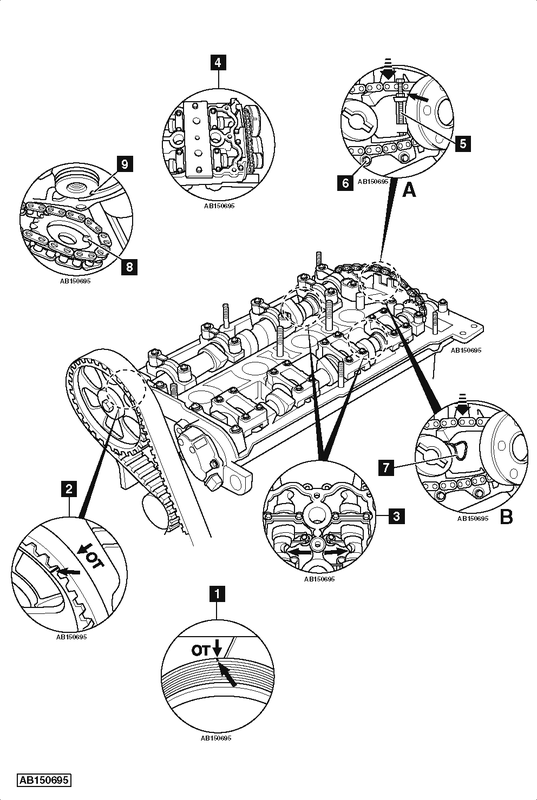 Ensure indents on camshafts positioned as shown  . Slacken exhaust camshaft adjuster bolt. NOTE: There are two types of tensioner. Compress timing chain tensioner and lock with retaining tool and M5 nut  . Remove timing chain tensioner bolt  . NOTE: DO NOT overtighten chain tensioner retaining tool as damage may occur. Remove exhaust camshaft adjuster and chain. Ensure camshaft alignment tool correctly located  . Fit camshaft adjuster and chain. Use new bolt. Ensure exhaust camshaft adjuster locating pin aligned with notch on camshaft  &  . If not, repeat installation procedures. Tighten bolt of exhaust camshaft adjuster. Tightening torque: 20 Nm + 45°. Install timing chain tensioner bolt  . Tightening torque: 10 Nm. Remove chain tensioner retaining tool and M5 nut  .